Ginger adds a unique flavor to these savory, slow-cooked to perfection pork chops and tender vegetables. 1. 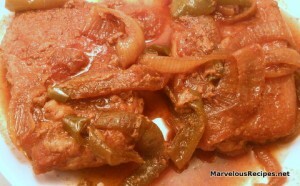 Place chops in a 3-quart slow cooker; top with the onion slices and bell pepper strips. 2. In a small bowl, combine the remaining ingredients; pour over the vegetables. 3. Cover and cook on Low for 6 hours or until the chops and vegetables are tender. Makes 6 servings. Oh yum, I love the sound of the ginger in this.